I am a 43-year-old woman with bipolar disorder. I was diagnosed at 34 while living in Spain with my six year old daughter. Several months before that, we had been effectively abandoned by her other parent (who returned to England). My mental health deteriorated rapidly and with devastating consequences: I decided I had no choice but to go back to England where I knew my fate would be a long stay in a psychiatric hospital. I also knew that I would have to give my child to somebody else to look after, which was something that I had fought hard against. It was my ultimate fear to lose her. I felt that I had nothing to live for but her, yet in my ill mind I thought that my daughter would be better off without the troubles I dragged along with me. I decided to take my own life. Eight years later, in 2012, I was given the opportunity to produce a piece of work for the ‘feminist cultural activism’ module of my MA in women’s studies. As the weeks passed, I wondered how to respond to the module and decided that my work should create a strong reaction in people. I also thought about the women with mental health issues who I work with and how a lot of the stories I have heard over time have echoed my own. I started volunteering for MIND about three years ago, while still doing my BA, and went on to become a facilitator of a self-help group for women with complex mental health issues. I am now starting to run creative workshops for young people with mental health issues and young carers. Working with women with bipolar disorder made it clear to me that losing custody of children is a major concern for us. Once lost, it is only after years of reasonable stability and court appearances that mothers can hope for custody to be re-established. Obviously, the stress resulting from this situation has the potential to destabilise the mother further and start a vicious circle. It took me five years, £10,000 in court costs and a court order, that allows my ex-partner (who is not a psychiatrist) to decide when or if I have an episode, to finally get my daughter back home. My last serious bipolar episode was in February 2006. Working on my coursework in 2012, I was confronted with the question of whether to produce a gentle piece of work or whether to open myself up, lay myself bare and produce a highly intense and personal film. I have always thought of myself as a frustrated artist. The bouts of mania that I have experienced have elicited moments of total creative freedom to express myself without boundaries or censorship. When I encountered the work of a late British artist Jo Spence during the course, I began to realise that I had been, without thinking about it, using a form of phototherapy throughout my own life. Over the years I took hundreds of photographs with no formal training. And so, in March 2004, I took my camera out and photographed myself taking handfuls of medication. 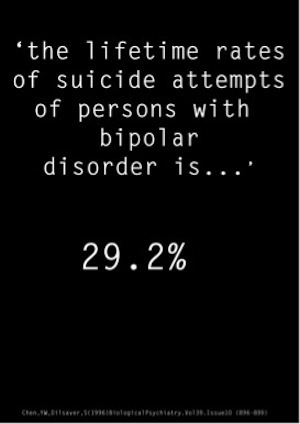 In 2012, I have decided to use these photographs to highlight the high rate of suicides and suicide attempts in women with bipolar disorder, probably the biggest taboo surrounding bipolar disorder, by making a short film. The pictures in my film are of equal importance to the soundtrack because one would mean nothing to me without the other. I had not looked at the photographs since they had been taken in 2004, partly because I felt the quality was not good and there was nothing to salvage from any of them, but also out of fear of how they would make me feel. As it turned out, the pictures on their own did not actually have much impact on me when I looked at them again. However, when I started the process of adding the soundtrack, I felt ripped from my current life and transported right back to the night of the overdose. The combination of the music and images was almost too much to bear as the music was the soundtrack to my time in Spain. I chose ‘My Immortal’ by Evanescence: a very powerful song that caused me to have psychotic episodes while in Spain. I made the film as gentle as I could, bearing in mind the serious nature of the subject. I started off using the word ‘bipolar’ in the opening slide so that the audience would know what disorder was being portrayed. I wanted to gently lead the viewer into the subject matter, as the film was not made to shock but rather to raise awareness. At the time of the overdose I was very alone. ‘My Immortal’ begins with the words “I’m so tired of being here”; I was tired of being alone in a foreign country and tired of being “lonely every single day”, as the film shows. I was ashamed and scared to admit that feeling to anybody for fear of the consequences. I was tired of ‘being’. The song moves on and I wasn’t sure about including this part of the film because I was almost admitting to myself, which was very hard, that my daughter’s presence in my life was making the act of taking my life very difficult: “If you have to leave, I wish that you would just leave, your presence still lingers here and it won’t leave me alone.” She was omnipresent. I put in the slide “my heart can’t love you anymore because you have broken it” because I felt that I was so broken at that time that I should try to not love her anymore. I did not mean specifically that she herself had broken my heart but rather that the situation in Spain with her had been instrumental in breaking me. I felt that I had set a scene before introducing pictures of myself. I kept the original colour saturation. To the words of the soundtrack at this point, “These wounds won’t seem to heal, this pain is just too real, there’s just too much that time cannot erase,” I decided to put up the image that I believe shows a real intense pain in my face. With the next two lines, “When you cried, I’d wipe away all of your tears. When you’d scream, I’d fight away all of your fears,” I put up the image of myself looking side on, straight into the lens. I wanted to show that I had cared so much for my daughter over the years; I had actually been a full-time mother since she was born. In the next section, “I held your hand through all of these years,” I used the image of the palms of my hands; this not only pertains to the word “hands” in the song but also the common body language signal of a showing of the palms to mean honesty. There is a radical shift at this point as the line “but you still have…all of me” relates to the medication that I was about to overdose on. In these images, it is the medication that now has “all of me”. The song becomes very gentle and instrumental at this point, as I show images of myself taking the tablets and then drinking them down. The next image shows me holding my head in my hands and looking completely bereft to the words: “Your face, it haunts my once pleasant dreams.” The final image before my lapse into unconsciousness shows dead despairing eyes and the words: “Your voice, it chased away all the sanity in me.” I didn’t feel that this was particularly the case but I certainly felt insane back then. It is at this point that I flashed up images of my daughter along with the words “I miss you,” “I am sorry,” “Forgive me,” “I LOVE YOU so much it is torture.” These are the memories I have of lapsing into unconsciousness; I lay down with a photograph of her. I decided to use the photographs of my slipping away but chose to give them an ethereal appearance. I wanted to reiterate how alone I had felt. I then put in a pure white slide that represents my coming round in a hospital, with a tube down my throat having my stomach pumped, being literally ripped out of unconsciousness. The whole experience was aggressive and angry and I chose to use the image, with the caption “enjoy the stomach pump” as an ironic statement. The nurses were angry with me because I was the source of my own injuries. I was not a ‘proper’ patient and to offer sympathy to me was not an option. I left this slide up for a longer period so that the words would take precedence. As I had survived the overdose I wanted my daughter to know that she now had all of me once more. And that the ‘all of me’ would be manic and depressed on occasion; that it would include stigma and unkind words. Next in the film, I highlight the list of 17 different drugs that I have been prescribed so far to show how often medics heavily drug women with bipolar disorder. I feel it is to silence us, to incarcerate us in our own bodies. I also wanted to highlight that, in a suicidal low, I have for many years had access to enough prescription drugs to try to take my life. Bearing in mind that the lifetime rates of suicide attempts among persons with bipolar disorder is 29.2%, that is a sobering thought. Yasmin Melany is a mature student doing an MA at the Centre for Women’s Studies at York University.